【 Feature 】 Silica gel has a large number of porous internal structure and owns a big absorption capacity for the water vapor, and all kinds of smell .Based on above special properties Silica cat litter is manufactured through processing and refining. Silica cat litter is a new type and ideal pet waste cleaning agents which have better properties than the past cat litter such as clay. 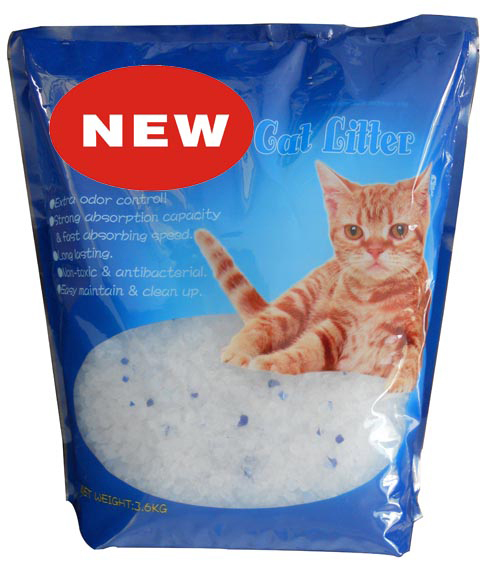 Silica gel being used as cat litter is a major improvement for the cat litter industry. the main ingredient of Silica cat litter is silica which is non-toxic and pollution-free, so that it can be a green product for family use. The used cat litter can be merely buried and doesn’t course trouble. Silica cat litter has the appearance of a white granular material and has a light weight; it is hard to be broken, can inhibit bacterial from growing and is the most popular cat litter products in the current international market. 1. Extra odor control! It can absorb and hold the urine and feces odor, thus keep the air in your room fresh & clean. 2. Strong absorption capacity & fast absorbing speed. It has millions of tiny pores in the surface, which can completely absorb the cat urine or liquid waste in feces in seconds, and leaves litter dry. It can adsorb liquid as over 80% of its own weight and still keep its appearance dry. 3. Long lasting. It is money & labor saving and lasts for long time; one 4 lbs. bag cat litter can last as long as one month without changing for one cat. 4. Non-toxic & Anti bacterial. It can keep cat litter tray dry which inhibits bacterial growth. Cat litter processed with antimicrobial is beneficial to sterilization. 5. Easy maintain & clean up. It is non-tracking, non-clumping, non-dust, with light weight, produces little waste, easy & safe for household use and can be disposed as normal waste. Due to the unique size and shape, it does not stick to cats’ paws and can keep litter from scattering or tracking out. 1. Fill litter box with silica gel cat litter to the lever of 1.5 inches. 2. Clean up the rubbish after use to keep clean periodically. 3. For more than one cat, you can reduce the period of replacing cat litter in proportion, rather than placing much more cat litter in the box, the proposed way to use one 3.6 L bag is following: a cat, one month, two Cats, about 15 days, three cats, about 10 days. 4. After the solid waste is dehydrated, scoop it out without any litter. 5. Store Cat litter box or silica gel cat litter in clean, non-moisture places, to extend its service life.